This white paper is a general guide to the specification, design and installation of automated control systems. The information and references are presented in a logical order that will take you from the skills required to recognize an operation or process suited for automating, to tips on setting up a program, to maintaining the control system. 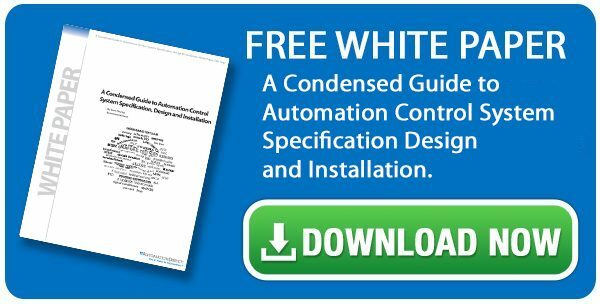 Whether you are an expert or a novice at electrical control devices and systems, the information in the Condensed Guide to Automation Control System Specification, Design and Installation White Paper should give you a check list to use in the steps to implementing an automated control system. It is our intent to produce this whitepaper as a usable guide, with additional, including a typical “real world” application that can be followed from concept to completion. It is not our intent for the guide to cover every possible topic dealing with automation control systems or to even suggest that the topics being covered are fully detailed. Instead, the topics are aimed at giving the reader a good starting reference for automated control systems. The A Condensed Guide to Automation Control System Specification, Design and Installation White Paper can be downloaded as a PDF here. To learn more about AutomationDirect, please visit: www.AutomationDirect.com.